A.D.A.M., S.A.T.I.S. and D.E.A. : Zegna’s “New Deal"
That the market would welcome a fabric like the Electa, created in 1929 and labelled Made in Italy, not to say Made in Zegna, could not have been taken for granted. It wouldn’t have been a question of the quality being inferior to the English standard, quite the contrary, but of ingrained habit on the part of consumers slow to move with the times. Most Italian wool mills would have balked at challenging the system by launching such a "different animal". No one would have felt sure of getting appreciable results from such a daring initiative. The temerarious few who might have tried would eventually have preferred backtracking, adapting the product or renouncing the brand to admitting failure. But Ermenegildo Zegna kept the product as it was, didn’t give up the brand and went about convincing the market. Challenging convention, modifying the frame of reference, changing the rules of the game takes courage and offers no guarantees, however much forethought accompanies it, but it can open up new scenarios and new possibilities. Ermenegildo Zegna spent a long time meditating that operation in two moves, the first of which, the branding of the fabrics, was to create the conditions for the second, the streamlining of product flows from the wool mill in Trivero to its clients. Putting the brand on the fabric was frowned on by the more intransigent wholesalers (wont to pass off Italian fabrics as English, with fat mark-ups of course), so Ermenegildo Zegna completed the operation by re-organizing the business to do without them. One step less and the opportunity (risky but potentially rewarding) to reach the tailors and thence consumers more directly, without filters or intermediaries pushing up prices to their own advantage. This reorganization took six years, from 1931 to 1937, and involved the setting up of three companies to provide differential distribution of fabrics from Trivero’s looms. It was neither necessary nor advisable to multiply the product range, but once the market was redefined it was a question of selling differently, more effectively and to the satisfaction of all concerned. True, marketing was an important factor in the success of that epochal change, but at the core of the strategy were the companies formed to put the “raw material” on the shelves, mannequins and counters of the tailors. 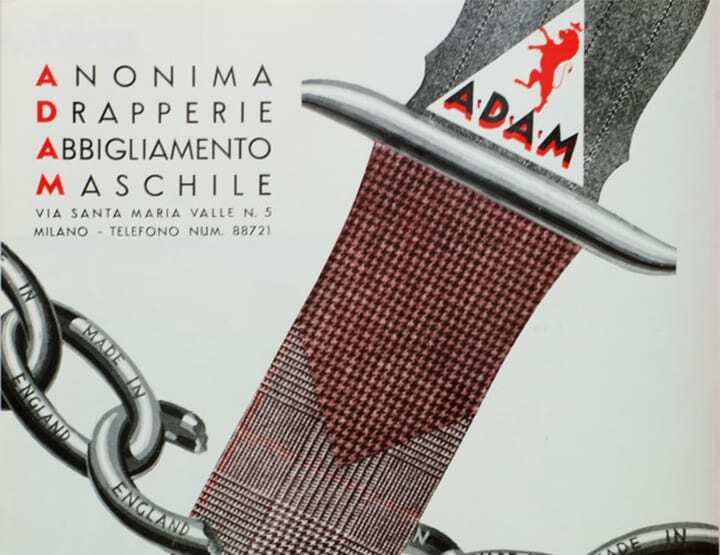 First came A.D.A.M., Anonima Drapperia Maschile (Milan, 1931), to supply the top tailors, who purchased a whole bolt or bolts and filled their shelves with premium fabrics from stocks kept to be able to promptly serve even the most demanding customers. Its trademark featured a lion rampant. First the lamb, then the lion: never one to bleat, Zegna had now started to roar. A.D.A.M.’s was the first lion brand, and the head of the animal kingdom was established in the corporate heraldry (like the family’s before it) for good. Next came S.A.T.I.S., Società Anonima Tessuti Italiani Soltex (Rome, 1935, and Turin, 1936) to supply tailors that ordered smaller amounts but of the same quality, the "tessuti del sole" (fabrics of the sun) that also went to the capital of Italy and to the capital of tailoring, ie. Naples. Shipments to these tailors included cuts practically made to measure for the end customers. Deliveries were more frequent and faster but also entailed more offcuts. This would have driven up inventory costs for Trivero but a solution was found for this inevitable drawback too. Ermenegildo Zegna set up D.E.A. Drapperie Esclusive Astrum (Biella, 1937) to sell off leftover stock. D.E.A. too had a lion in its trademark, and having been the last to be set up it was also the last to wind up (1988). So Zegna products continued to be channelled from the same origin but to different destinations and as there were no clothing manufacturers at the time, there had to be direct relationships between the Zegna Wool Mill and dozens of tailors all over Italy and abroad. This new era, a "New Deal" like the one Roosevelt had recently launched in the US, started under the best possible auspices.